Porcelain insulator markings help identify both the manufacturer and the date of manufacture. Most porcelain insulators are incuse marked, that is, a stamp was used to impress the manufacturer's logo into the leather hard clay prior to firing. Shown are some examples. 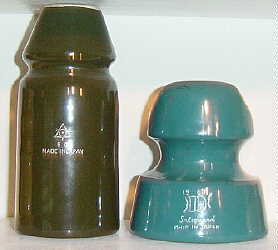 Older dry process insulators were sometimes embossed. Like with glass insulators, markings were engraved into the mold, and when pressed the letters would be raised on the insulator surface. A number of earlier Ohio Brass styles are also embossed. Some embossed samples are shown below. Recessed-embossed insulators are a combination of both types -- raised letters against a depressed background. Ohio Brass was the primary user of this technique, with their "B inside the O" mark. Some recess embossed examples are shown including the Harlow patent. Underglaze ink marked insulators are stamped with an ink pad prior to glazing. The glaze does not hide the mark completely, and so a permanent identification is made. This method is commonly used at present. Some examples are shown below. Ink stamped insulators are stamped on the surface of the glaze after firing. This is a relatively unusual marking technique. The two insulators made in Japan below are ink stamped. Sand-Blast markings have been used on some relatively modern multiparts and large uniparts. This mark is made by etching the glaze with a sandblaster through a stencil. The occupied Japan insulator shown has a sandblast marking. Wax resist is an additional marking technique where wax or oil is applied in a pattern on the unglazed porcelain before glaze application. The wax keeps the glaze from sticking, leaving bare porcelain exposed in the desired lettering or pattern. The wax or oil evaporates during the glaze firing. This is a relatively uncommon marking technique that has been used on some non-North American porcelain and on some factory glaze tests. 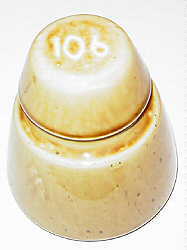 A Pittsburg glaze test marking is shown below.